Innovative suite of integrated graphics displayed at multiple scales connect home wastewater and its infrastructure impacts. Photos by Brett Snyder and Claire Napawan. For the majority of Californians, water appears effortlessly when and where you need it. It shows up in your faucet and flows out of your backyard hose with just the turn of a handle. And, it leaves just as predictably – rinsed down your kitchen sink drain, flushed down your toilet. However, the outgoing water is often full of things like fats, oils, and greases (also known as FOG waste) that can lead to problems in local sewer systems and beyond. One of the biggest challenges in addressing FOG waste is rendering visible the largely invisible connection between household wastewater and city infrastructure. Claire Napawan, a landscape architect and urban designer in the Department of Human Ecology at UC Davis, and Brett Snyder, an architect and graphic designer in the Department of Design at UC Davis, were excited by the opportunity to develop an innovative public art installation to do just that. A speculative art installation at San Jose City Hall meant to communicate the extent of mostly invisible sewer infrastructure in the city. Image by Brett Snyder and Claire Napawan. Working with the City of San Jose as part of a unique collaboration between the city's environmental service and transportation departments, as well as its Public Art Program, Napawan and Snyder engaged with impacted communities to better understand how citizens deal with their kitchen waste in particular. Napawan says San Jose's initial request for proposals on dealing with FOG waste – titled “Public Art Project for Environmental Awareness of Sewer System Impacts” – was a shock. It asked for the exact kind of thing that she and Snyder do, which is work at the interface of design, infrastructure, and community participation. Napawan and Snyder took the participatory process seriously. 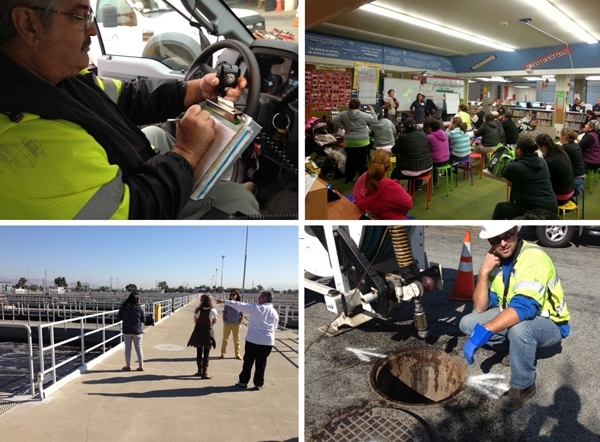 Working with the city to identify FOG waste hot spots – places where the greatest number of FOG-related sewer overflows occurred – they found neighborhoods that also tended to be predominantly immigrant, low-income, or communities of color. They then worked with the city's Office of Cultural Affairs and local city council members to determine the best avenues to begin working with these communities. They honed in quickly on parent groups associated with local public schools. 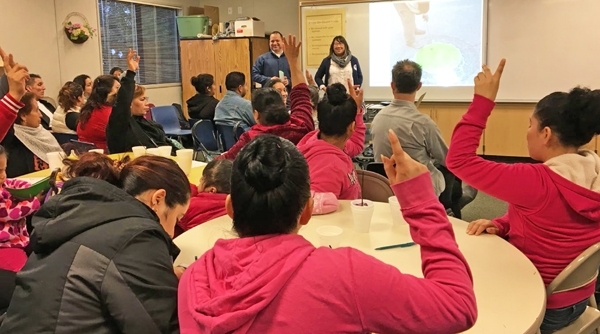 The groups were already set up to provide opportunities for community members to discuss concerns including education, health, and environmental stewardship. Engaging with parent’s groups on FOG waste issues. Workshops were conducted in English, Spanish, and Vietnamese. Photo by Mary Rubin, San Jose Office of Cultural Affairs. In response to their research, the artists developed a suite of interventions that draw connections between kitchens, the hidden infrastructure, and the broader watershed surrounding the city with integrated graphics on flashcards, manhole covers, and sewer maintenance vehicles. Photos by Brett Snyder and Claire Napawan. Based on what they learned during the participatory design process, Napawan and Snyder designed a suite of materials that connected household kitchen waste with sewer infrastructure. 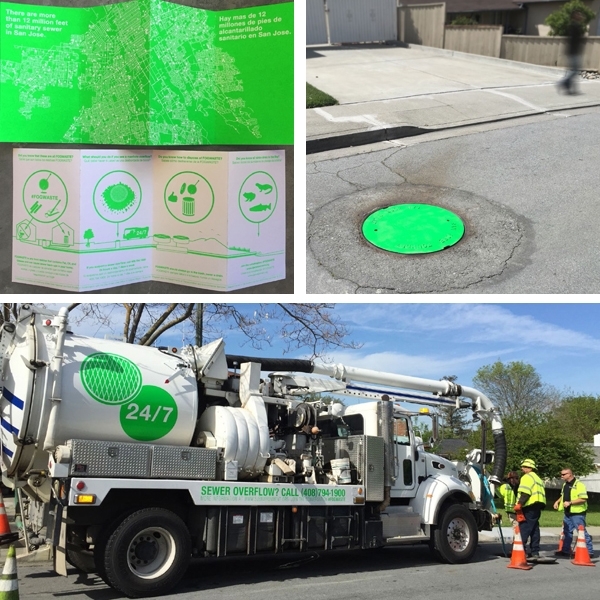 The materials included flashcards that provide reminders of the kinds of kitchen waste that contribute to the FOG problem, marked manhole covers on city streets, and related graphics on wastewater trucks. Together, the trio of bright green and integrated graphics served as a reminder of the connection between individual kitchens, city infrastructure, and the larger ecosystem of the San Francisco Bay Area. The project was developed with communities that maintain the infrastructure and those served by the infrastructure. It included ride-alongs with maintenance crews, touring water treatment facilities, and multiple community workshops. Photos by Brett Snyder, Claire Napawan, and Mary Rubin. Napawan and Snyder hope their work can provide an example for other municipalities to consider small-scale design interventions and community-based participatory approaches to urban environmental challenges.